F-15SE Silent Eagle is an upgraded version of the F-15 Strike Eagle. Image courtesy of Boeing. The F-15SE flight demonstrator aircraft, F-15E1 completed its maiden flight in July 2010. Image courtesy of Boeing. F-15SE Silent Eagle features a stealth design which reduces its radar cross section. Image courtesy of Boeing. The F-15SE features a conformal weapons bay. Image courtesy of Boeing. 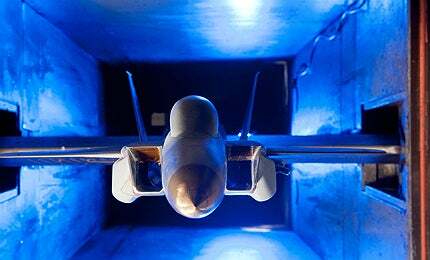 Wind tunnel tests of the F-15SE's conformal weapons bay were completed in June 2012. Image courtesy of Boeing. A scale model of the aircraft was used to conduct the wind tunnel tests. Image courtesy of Boeing. The F-15SE will be fitted with next-generation Joint Helmet Mounted Cueing System. Image courtesy of Boeing. F-15SE Silent Eagle is an upgraded version of the F-15 Strike Eagle aircraft, being developed by Boeing for international customers. The F-15SE features an innovative design which reduces its radar cross section. A prototype of the F-15SE Silent Eagle aircraft was first unveiled in March 2009. The F-15SE flight demonstrator aircraft, F-15E1, completed its maiden flight in July 2010. "The F-15SE flight demonstrator aircraft, F-15E1, completed its maiden flight in July 2010." F-15SE is 63.6ft (19.4m) long, 18.5ft (5.6m) high and has a wingspan of 42.8ft (13m). The basic design of the F-15SE is similar to that of the F-15 Strike Eagle aircraft with new components added. The new components include the conformal weapons bay (CWB) instead of the standard conformal fuel tanks. The CWB significantly increases the internal carriage capacity of the aircraft and also reduces its radar signature. Two additional weapons stations have been included to enable the aircraft to carry an additional four air-to-air missiles. The Silent Eagle also features twin vertical tails canted 15° outward. Canted tails provide rear lift to the aircraft and reduce ballast usage, while increasing the range by 75 to 100 nautical miles. Coatings will also be applied to various areas of the aircraft to minimise the radar signature. The F-15SE has also been designed to function as a non-stealthy, multirole aircraft. The CWBs can be removed and the aircraft can be reconfigured to include conformal fuel tanks based on mission requirements. Boeing commenced development of the F-15SE as an evolution to the F-15 family of aircraft. The company signed a Memorandum of Understanding with Korea Aerospace Industries in November 2010 for development of the F-15SE’s CWB. Boeing successfully completed the weapons launch from the left CWB of the F-15E1 flight demonstrator aircraft in November 2010. The F-15E1 launched an inert AIM-120 demonstrating the aircraft’s ability to deploy a missile in flight. "The F-15SE can carry air-to-air missiles, such as AIM-120 and AIM-9, and air-to-ground weapons." Wind tunnel tests on the CWB of the Silent Eagle were completed in June 2012. A scale model of the aircraft was used to test aerodynamics of the CWB design. Boeing has offered the aircraft for the F-X III competition launched by South Korea’s Defense Acquisition and Procurement Agency to procure 60 new fighter aircraft for the Republic of Korea Air Force. The F-15SE is competing for the $7.3bn order with the Eurofighter Typhoon and Lockheed Martin’s F-35. The three companies submitted their formal bids in June 2012. South Korea was scheduled to decide the winner of the competition in October 2012 but the decision has now been postponed to mid-2013. New orders from Saudi Arabia and Japan are also the driving forces behind the development of the next generation of F-15 aircraft. The development cost of F-15SE is estimated at $100m each. Boeing plans to offer the aircraft to five foreign customers with an estimated market for 190 orders. Flight testing of the F-15SE is expected to be carried out in 2013. The F-15SE will be fitted with two General Electric F110-GE-129 turbofan engines providing thrust of 29,000lbs or two Pratt & Whitney F 100-PW-229 engines providing thrust of 29,000lbs. The F-15SE will feature next-generation Joint Helmet Mounted Cueing System produced by Vision Systems International, Elbit 11in x 19in Large Area Display (LAD) system on the front and rear cockpits, digital fly-by-wire flight control system, Link-16 Fighter Data Link and infrared search and track (IRST) system. An advanced targeting pod provides the aircraft with target identification and autonomous tracking capabilities. A navigation pod will also be fitted to the aircraft providing it with all-weather and night-attack capabilities. The aircraft will also feature advanced electronic equipment including BAE Systems digital electronic warfare system (DEWS) and active electronically scanned array (AESA) radar. The F-15SE can carry air-to-air missiles, such as AIM-120 and AIM-9, and air-to-ground weapons including precision-guided weapons, JDAM and globules admire. The F-15SE can fly at a maximum speed of 2,655km/h. It can climb at the rate of 15,240m/min. The aircraft will have a range of 3,900km and a service ceiling of 18,200m. The empty weight of the aircraft will be 14,300kg and the maximum takeoff weight will be 36,741kg. The aircraft can carry a payload of 11,748kg. The Boeing F-15E dual-role fighter is an advanced long-range interdiction fighter and tactical aircraft. Boeing RC-135 is a four engine, medium weight reconnaissance aircraft designed and manufactured by Boeing Defence and Integrated Systems for the US Air Force (USAF).